Indeed, but there's 2 version of horseshoe the way I look at it, if you moved Master Gundam and Tauburn back one spot, a lot of AoE conal hissatsu would only hit the front 3. If I ran horseshoe, that's the version I'd run. If I move those units back I loose my motility bonus, updated my previous post. The only unit I sometimes move back is Tauburn as he already has high motility. That puts my team in a T formation when I do that. Yes, I suppose one formation isn't objectively better than the rest. Sega did a good job giving the most dangerous area (front two rows) an added bonus, risk vs. reward. -OXO (unit skip unit) can avoid some line attacks. Not all line attacks hit 3 spaces deep, some are just 2! Those are just some things I've noticed. I don't think back row is as bad as some people think, especially for support units. Middle row is really good for action gauge naturally, if you could sortie units which give initial cores, you could possibly even alpha strike other team with a 3x2 conal on round 1. If you have any thoughts, would love to hear them. My setup does exactly that, that's why Master Gundam sits on the second row. When I go for instant hissatzu I replace Tauburn with an attacker eva. I've finally spotted one of you on Arena, and it was Mattman. Glad he wasn't using his real team. 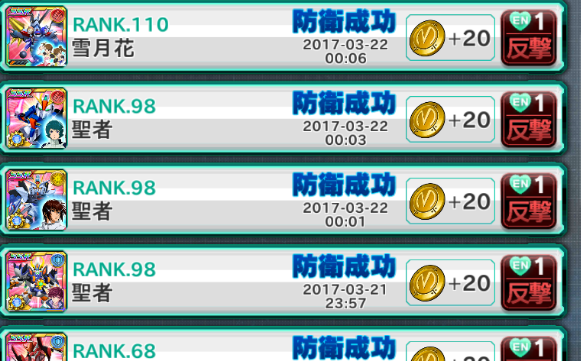 (03-24-2017, 12:06 AM)Hypereia Wrote: I've finally spotted one of you on Arena, and it was Mattman. Glad he wasn't using his real team. That is my real team. Best handle Sayaka with care, or Godzilla will be forced to step in, and boy, you don't want that. Just before Godzilla delivers the final strike, Sayaka has a... wardrobe malfunction. Forced to make a tactical retreat, they ride off into the sunset. Even Sumire with Ex-ability? Looks like you could get 100% Guard on her, 80% with Ex+20% set bonus. Maybe she could be good for a status inflict team? Did we figure out yet if a Guardian's gauge speed (for their super attack) can be increased with Speed parts? If not, I guess the best bet is to go pure Power.